Scan to BIM is becoming the latest hot topic. But what is it, and how did we get started? Firstly, just to clarify; Scan to BIM is the process in which data taken from an existing building survey. The data is then translated into a Building Information Model. Currently the best and most comprehensive way of achieving this is through laser scanning. 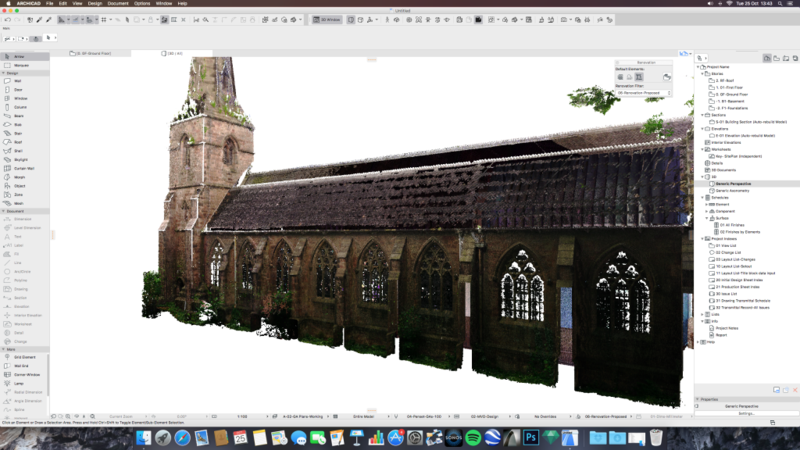 A laser scan will provide site data in the form of ‘Point Cloud Data’. This data contains millions of points, each of which contain an RGB (Red, Green, Blue) value. The point values not only give physical location, but a colour value too. Put all these points together, and you have what is know as Point Cloud Data. How we started with Building Information Modelling. For over two years, we have been developing and expanding our use of Building Information Models (BIM for short). Each and every project is now delivered from a BIM model. At first we were sceptical and did not see how it would provide benefit to the company. After-all, we mainly undertook small to medium scale refurbishment and renovation projects. We would tell ourselves, ‘By the time we have surveyed and modelled the building in 3D, we could have drawn it and issued in 2D in half the time’. To begin with this proved to be true to some extent. We made a commitment to ourselves. A commitment to deliver each new project in the BIM environment. We knew that if we did not make such a commitment, all we would achieve is an ad-hoc hybrid part 3D and part 2D model or drawing. It would have been far to easy on each project to revert back to the 2D method of drawing, especially when things got a little challenging. We persevered for over 18 months. New techniques were learnt and we enhanced our abilities along the way. We found that after only 12 months of real world experience within the 3D Building Infomration Model, all was making sense. After the 12 month period of sometimes stressful perseverance, I can assure you we do not look back. Each and every project is now delivered within the BIM environment. Experience has told us how far each and every project needs to be taken, but the discipline and fundamentals remain consistently the same. Point Cloud Data captured from an on-site laser scan. Building upon our experience, we now offer our scan to BIM services to Architects, surveyors and designers. We are also happy to share our experiences with others. As designers ourselves, we understand how the BIM model will develop and evolve throughout the project. Outsourcing has become a proven method of increasing productivity within companies. We are really good at what we do, so we offer it to others. Many want to outsource the time consuming task of modelling an existing building. Some may not yet have the confidence to prepare a model or perhaps its your first project and can appear a little daunting. However, once the model is completed, floor plans, sections and elevations can be created from any part of the model. Take a look at one of our short videos here as an example. 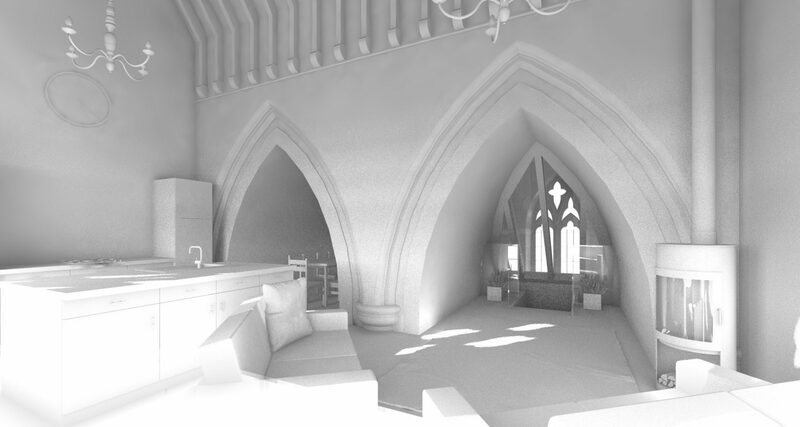 We will listen to your requirements to gain an understanding of what you are seeking to achieve from a BIM model. Next, from your brief we will issue a detailed, fixed price quotation to provide you an ArchiCAD BIM model of the building from point cloud data. We will also provide you with a timeline for delivery of your ArchiCAD model. You have instructed us to proceed, what next? As soon as we have received a written instruction to proceed, we typically have a 21 day lead-in period. 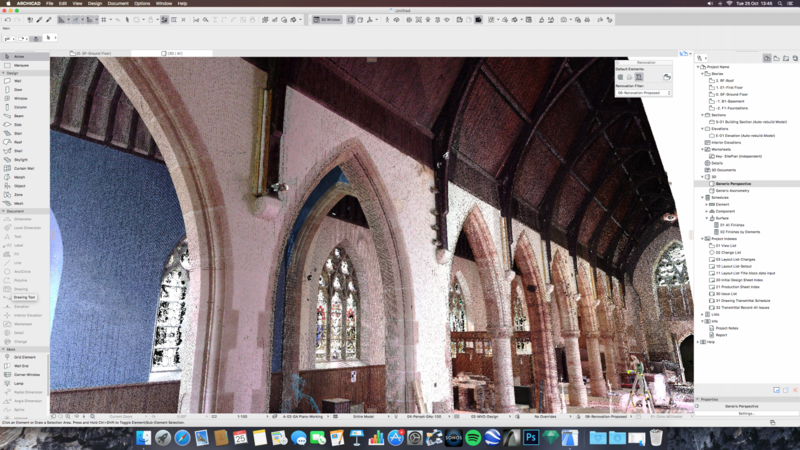 This lead-in period allows us to co-ordinate a laser scan to obtain point cloud survey data of the existing building. Once we have obtained the point cloud survey data, we proceed to parametrically model the building in ArchiCAD 20. Depending upon the complexity of the building this can take anything from 5 days onwards. 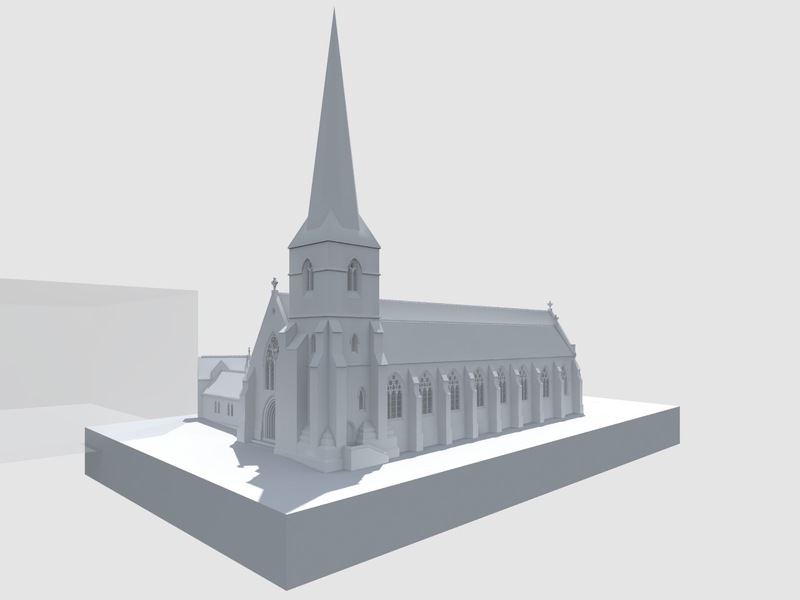 To give you an example of the time and detail of our BIM models, take a look at the church in the images above and below. This model took just over 100 hours! From our experience, we have found that an upfront detailed BIM model will save time, stress and money in the long term and duration of your project. The model will enable you to explore concepts and designs with clarity and confidence. We don’t deny that you may be able to commission a cheaper ‘BIM’ model from an outsourced foreign country. Try it out, and give us a call on 01283 820912 when you realise that the model is near useless. It will only serve to reinforce the value in what we have to offer. Want to know more about ArchiCAD and BIM? If you would like to find out more about ArchiCAD and modelling in BIM take a look at these usefull resources below. We generally like to offer further reading on our posts. The books below will go in to much more detail and should provide you with a better understanding of the process. The book ‘BIM in small practices’ is usefull if you or someone you know has been thinking about upgrading to BIM, but is nervous about taking the plunge. We spent around 6 months evaluating various software for delivering BIM. In the end, as you may expect we were left with two contendeners; ArchiCAD vs Revit. We ran extensive demo’s with them both. Autodesk’s Revit does appear to have the market share and is a very good package, however we didn’t feel it offered us what we were looking for, and enable us to offer the service we want to provide our clients. We are not affiliated with Graphisoft in any way. 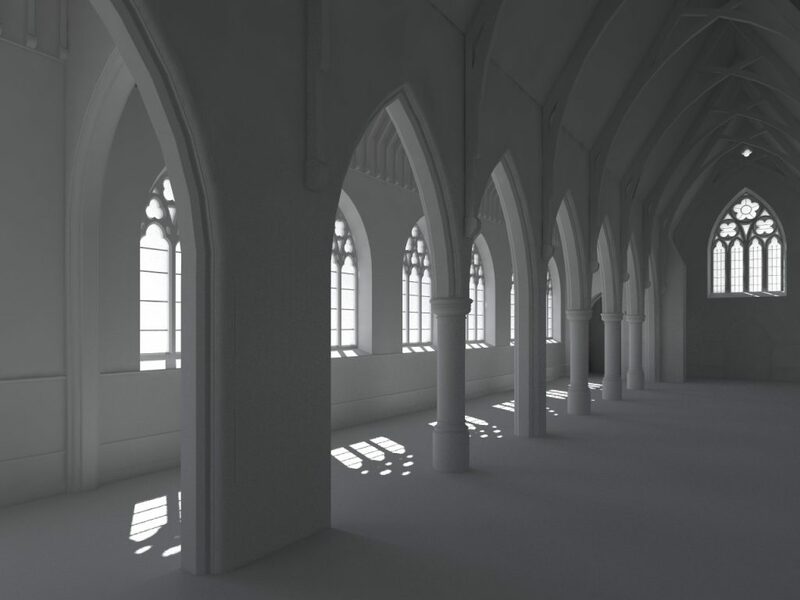 But what I will tell you is; how amazed many Revit users are when they see our BIM model in the ArchiCAD environment.